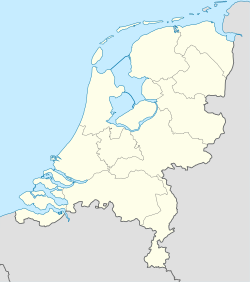 Sloten (Dutch pronunciation: [ˈsloːtə(n)]; West Frisian: Sleat) received city rights in 1426, and is the smallest of the eleven Frisian cities. It lies within the municipality of De Fryske Marren. Sloten is one of the smallest cities of the Netherlands and is a popular place for sports such as sailing since it is located near the Slotermeer. It is a historical city with old buildings and a windmill, De Kaai, in the center of the city. It had a population of around 715 in 2017. Before 2014, Sloten was part of the Gaasterlân-Sleat municipality and before 1984 it was a independent municipality. This page was last edited on 11 January 2019, at 23:29 (UTC).